at new Nitehawk Cinema Prospect Park! Two dates: Saturday, April 27th and Sunday, April 28th. Get Tickets HERE! The new Spoons, Toons & Booze continues at Nitehawk Cinema Prospect Park in a larger theater for more cartoon lovers with wackier contests, an even more tricked out cereal bar and prize table, and surprises for both longtime fans and newcomers to the show with tons of ‘toon tomfoolery! 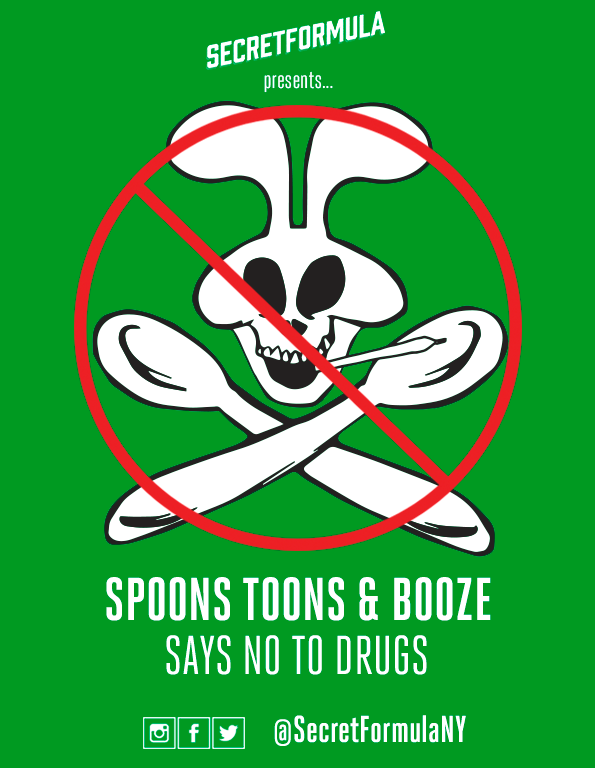 – Special menu of anti-drug themed episodes including the super rare “Cartoon All-Stars to the Rescue”, the 1990 government-sponsored anti-drug PSA that includes just about every cartoon character from your childhood! Only aired on TV once, we’ve got an exclusive copy smuggled from the Pentagon vault just for you! – Satisfy your munchies with our free, all you can eat cereal bar filled with all the sugary, marshmallowy, fruity, chocolaty cereal you crave. Soy and regular milk available! – Cure your dry mouth with amazing NEW specialty cocktails like the Fruity Pebbles Aperol Spritz, plus old favorites like The Sonny, a White Russian topped with Cocoa Puffs! – Compete in contests (including The D.A.R.E. Challenge) to choose which cartoons we watch and win cartoon- and cereal-themed prizes plus tickets to Nitehawk Cinema!